Well, the trade deadline is approaching and the Reds are running neck-and-neck with the St.Louis Cardinals. There are a lot of rumblings about the Cardinals making a big move, perhaps even reeling in big fish Roy Oswalt. If that happens, then the Reds could be moving backwards simply by not moving forward. As the old saying goes, if you aren't improving you are just standing still. That said, what move should the Reds make. Obviously, the one that provides the most bang for the buck. And, the obvious weaknesses in the 25 man roster are 1) leftfield, 2) shortstop, 3) #1 starter, and 4) high leverage reliever. So, the million dollar question is which one should they target? First and foremost, we can scratch number 1 starter off the list. Truth be told, the Reds are in fairly good shape in the rotation due to the emergence of Travis Wood and Mike Leake. The return of Edinson Volquez hasn't gone as smooth as hoped, but the potential is there for him to have an impact. At the moment, the Reds may not have a true #1 starter to anchor the rotation, but they have a lot of quality arms with good upside. If they actually were interested in acquiring a #1 starter, then they should have gone after Danny Haren, who went to the Angels for the unbelievably low price of Joe Saunders, Patrick Corbin, Rafael Rodriguez, and a PTBNL (rumored to be Tyler Skaggs). With Haren off the market, the price is likely to be too high on any of the remaining pitchers who would represent an improvement. Well, I'm still not a Orlando Cabrera fan. In fact, he's about as bad as I expected him to be, but at this point it's difficult to imagine being able to acquire a shortstop that represents a significant upgrade. The Reds need an impact player and those are tough to come by at the shortstop position. Improvements in the Reds' W/L record will follow improvement in team Run Differential. Accordingly, the Reds need to focus on trades that will significantly improve the team Run Differential, which will be difficult to accomplish simply by acquiring a new shortstop. That said, if I was the GM, the one shortstop for whom I'd make a strong play is Jed Lowrie, who could be a legitimate impact bat at either shortstop or second base. Not to mention, he could also spell Scott Rolen when he needs a breather from carrying the entire team on his back. Still, Lowrie may not be quite ready to step into full-time duty after missing most of the season with mono, but he would be an asset both this year and well into the future. I'd love to see the Reds add a high leverage reliever who can work some quality innings, but the volatility of relievers always makes me nervous. One of the worst trades in recent organization history illustrates the problem of dealing for relievers. The Reds shipped Felipe Lopez, Austin Kearns, and Ryan Wagner for a package including a couple of relievers. Obviously, that deal didn't turn out very well. The price was high, but the production was not. Like most Reds fans, I have fond memories of the 1990 squad that featured the Nasty Boys. The value of having 3 elite, shutdown power arms working high leverage innings cannot be overstated. That said, it's simply not easy to find those guys in this day and age. It's unlikely to be worth it to pay the price necessary to get relievers of this type when they are already established, but the inherent volatility of the position would make trying to identify them before they are established at the MLB level would be equally problematic. If the Reds were to head in this direction, I wouldn't mind Brandon League of the Seattle Mariners. He has a big arm and very heavy groundball tendencies. Leftfield is commonly referred to as an "offense-first" position. While it's true that the lesser defensive demands of the position lends itself to hiding sluggers, the fact remains that, regardless of position, a player's value is a function of his runs created and runs prevented. So, the rules of baseball value don't cease to apply simply because conventional wisdom holds that leftfield defensive doesn't matter. Defense matters....everywhere. That said, Jonny Gomes, who conventional wisdom holds has been a significant asset to this team, has actually been dragging the team down. If the Reds want to make a push for the postseason and be serious contenders, then they need to remove Johnny Gomes from full-time duty. Plain and simple. Cut and dried. Gomes certainly has value, but he needs to be used appropriately to bring out that value. I was high on Gomes when he was first signed and I still like him now, but that's dependent on using him correctly. First, his glove is so poor that it completely drags down the value of his production. It's hard to believe, but his glove really IS that bad. Gomes would be most valuable used as the righthanded portion of a platoon and a power bat off the bench. 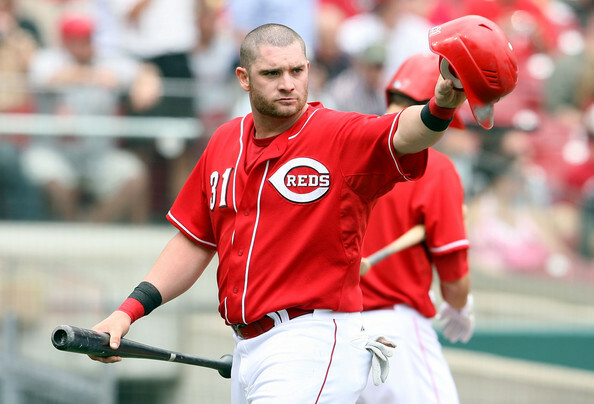 During his time in Cincinnati, Jonny Gomes has quickly stepped into the shoes of the faithfully departed Adam Dunn. Gomes isn't just taking the over the 7th position on the lineup card, but also the role of the lightening rod that was inadvertently filled by the Big Donkey. For years, Dunn straddled the divide between the sabermetricians and the traditional scouts. Sabermetricians used more advanced metrics to value Dunn, while the more traditional scouting valued him based on his tools and how he went about his production. Obviously, depending on what you use to evaluate him, he grades out very differently. Despite the accolades he receives from some quarters, the truth is that as of now Gomes is producing at almost exactly a replacement level. In essence, the Reds are getting almost no production out of the leftfield spot. On offense, Gomes is hitting .274/.326/.461/.787, which is hardly inspiring production for an "offense-first" position. Of course, his 13 homeruns and 64 RBI are used as evidence of his "strong production." In truth, even his offensive production hasn't been strong, as evidenced by his 2.0 Park Adjusted Runs Above Average. For comparison sake, Brandon Phillips (7.5), Ryan Hanigan (4.9), Ramon Hernandez (3.2), Joey Votto (35.4), and Scott Rolen (15.3) are all significantly better in Park Adjusted Runs Above Average. Obviously, his offense isn't really driving his value, which is problematic because we haven't gotten to the disturbing part of his game. Whatever offensive production that Gomes generates above the norm, he then gives right back on the defensive side. On defense, Gomes rates out as 10 Runs Below Average on the UZR metric. When extrapolated out over 150 games, Gomes' defensive production grades out at 21.7 Runs Below Average. When your defensive performance is so far below average, it takes very strong offensive production to make up for it. Gomes simply doesn't provide enough offense to carry his glove. Not surprisingly, Jonny's total run production grades out poorly. His Runs Above Replacement is a meager -0.1. In essence, Jonny is replacement level, which is stunningly bad production. The type of production you would expect from the 25th man on the roster when called into action off the bench. When you translate his total run production into Wins Above Replacement (WAR), Gomes grades out as 0.0 wins. He provides zero wins above what a replacement player would provide. If the Reds truly want to upgrade, then they need to get better total run production from leftfield. The best acquisition would be Jayson Werth, who over the past few seasons has been roughly 5.0 Wins Above Replacement. Obviously, acquiring Werth more than halfway into the season would limit the amount of games he would get to play for the Reds, but he would still represent a roughly 2 win improvement over the remainder of the season. By going from Gomes to Werth in leftfield, the Reds could ultimately be going from 85-86 wins to 87-88 wins. That could be the difference between the postseason and another uneventful October. If the Reds cannot or will not acquire Jayson Werth, then they need to consider internal options. In fact, Chris Heisey or Chris Dickerson might be the better option as the full-time starter. Or, using Jonny Gomes only against southpaws. Or, maybe even a Chris Heisey/Danny Dorn platoon, which personally I'd love to see. In Dorn's minor league career, he hits .312/.394/.549/.943 against righties, while Heisey hit .339/.415/.506/.921 against southpaws. Of course, the Reds would never give Dorn a legitimate shot at the heavy side of the platoon, but they could also go with Juan Francisco or another lefthanded option. Whatever they do, they would be hard pressed to get worse total production than what is being provided by Jonny Gomes. It would also allow Dusty to use Gomes in a role that better utilizes his skills and enables him to provide better overall run production. If the Reds want to make a serious postseason push, then they need to look hard at areas of weakness and figure out ways to improve them. The Reds simply aren't good enough to succeed with replacement level production at an offense first position. I like Jonny Gomes, but he has to be used correctly. The Reds need to get better production from leftfield, plain and simple. This was by far the most boring thing i have ever read that is baseball related. Wow is all that can really be said, just WOW! Sorry to hear it. There are all kinds of blogs and websites out there that might be more appealing to you. If you don't like mine, then I'm sure you'll be able to find countless others out there that you do enjoy. I don't mind having Gomes in LF, but the Reds could defiantly use an upgrade there. Great post as always Lark, keep them coming! i really think we need ocab out of our lineup. but that's just my opinion. 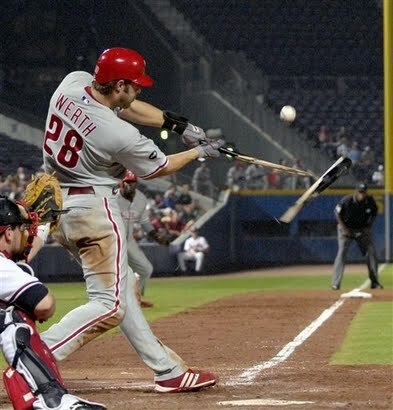 good post lark, who besides werth might you go after for left? Gomes certainly has a good backstory and attitude, but you're right, a dirty shirt isn't enough to make up for a lack of production. I'm not an O-Cab fan either, but I'm just not sure who we could get that would represent a significant upgrade. I'd love to get Jed Lowrie, but the BoSox are not easy to line-up with in trade. I've heard Stephen Drew's name tossed around, but I'm not a huge fan of any of the Drew brothers. I don't think any of the elite options are a possibility, so that rules out Jeter, Elvis, Hanley, and Tulo. I don't see us being able to acquire any of the playoff contending team shortstops, so Aybar, Furcal, Hardy, Uribe, and Everth are out. I'm just not sure who that would leave, Jack Wilson? Yuniesky? Ian Desmond? Desmond intrigues me, but he's just a rookie and probably isn't really an upgrade at this point. All in all, shortstop is a very difficult position to find an impact bat. For me, Lowrie is the guy. You raise an interesting point. The stats I was using analyze production at a higher level than Batting Average with Runners in Scoring Position, but it is included. That said, there certainly IS value to a player who can raise his game in high leverage situations. Unfortunately, I'm just not all that convinced players can actually do that. And, to the extent it can be done, I'm not convinced that Gomes is one of the players with that capability. Frequently, such variation is due to the small sample size of high leverage situations. I suspect that over the course of Gomes' career, his splits are not consistently better in high leverage situations. Still, if he WAS able to do so, then he'd get an additional bump in value in my book. Anyway, thanks for the comment, I didn't explicitly consider BA with RISP when writing this up. For some reason I got so wrapped up in the shortstop discussion that I forgot your question on leftfield, which might have been for the best since I just don't see many viable options out there. Given our needs, I think David DeJesus would have made a lot of sense. He could play plus defense in left and hit leadoff. However, his high price tag and subsequent injury makes it a moot point. Ultimately, it looks like we are left with Corey Hart, Jayson Werth, and Adam Dunn. Personally, I wouldn't touch Corey Hart. 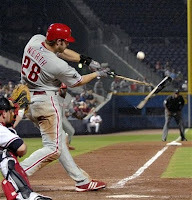 I don't like him as a hitter and believe he more resembles the hitter from 2008 and 2009 than the hitter we see in 2010. I'm on record as being a huge Jayson Werth fan, so obviously he'd be my target. And, of course, the Big Donkey. Really tough to imagine the Reds bringing him back to town. Outside of that, who is out there that makes sense? I can't really think of anyone. Ideally, we'd be able to bring in a plus defender who hits lefty with leadoff skills. I'd love to get Denard Span, but the Twins covet him and would probably never move him. Unfortunately, not too many out there that fit the bill, so we might be left trying to fill the gap with internal options. Maybe Chris Dickerson makes some sense. Anyway, I'd be curious to know who you would target. Any leftfielders out there that catch your eye??? I think the game today made clear (if the stats haven't already) that we need to make the move to Heisey in left. Two months of Gomes ops'ing 700 is a big sample size. His power has waned which is why everything else drags him down to replacement level. Heisey is not a slouch in any area and has been productive with irregular playing time. I don't think he is the type to be exposed with more PT. He has the makeup and the tools. I think he can be a .300 hitter and I don't think a platoon is necessary. The team just needs to show they have guts like they did when they gave Leake the 5th spot out of spring. Gomes will be a spark plug in more limited duty. i honestly think nix should be replaced with balentien and have him split time with gomes and see if he can take the majority of starts. i like competition. At SS, Maicer Izturis has always been a favorite of mine and LAA is looking like they just aren't gonna make it. Unfortunately I doubt he would get thru waivers. I also love Jason Bartlett of TB and his young counterpart Reid Brignac. Again though doubt we could get them. The same with Drew who I wouldn't mind either, it's a solid upgrade. If it's LF that interests you I like Kelly Johnson from 'Zona. IIRC he was an OF converted to the IF. Unfortunately I doubt we could get our hands on him, his salary is really low so we'd have to cough up a significant prospect and not sure he is quite worth that. I also liked Alberto Callaspo but of course the Angels snatched him up and I think it was as much for the future (at 3B and at the top of their lineup) as it was perceived for a potential playoff run. Though I'd still call and offer up a nice package for Izturis (especially now with Cabrera's injury). A bit of a stretch but a guy I still like who I think we could get is Jeremy Hermida who was just DFA. A Hermida for Balentein deal makes some sense. Maybe we even wait until Hermida clears waivers to do it. Anyhow I still think we could have done worse this season than Cabrera, although we certainly could have done better. He isn't what I had hoped he would be but to hear folks talk about him you'd think he was totally blowing it. I don't know what his UZR is or his WAR but I'm guessing he's been better than Janish would have been. Then again I am willing to admit that Janish may have actually improved again this past offseason to be above replacement level, I think we will see soon. And one that is kinda crazy but just might work Harang & Gomes to LA for Manny & DeJesus Jr and cash. Oh and I'd much rather have Cozart starting next season at SS than Jed Lowrie but I'd be interested to hear why Lark likes Lowrie so much he seems like a 2B only to me. Reid Brignac is a guy though like I mentioned earlier that I like alot. But a deal with TB in the offseason for either SS I could live with also. We could match up well IMO, Alonso needs a home and he is cheap for a while and Carlos Pena is on his way out to FA, I think they would prefer to keep Crawford over him if they keep either. But again I think Cozart will play fine there starting next season. To be honest, I think it's time to promote Dickerson for centerfield and leadoff and plug Heisey into left and the 2nd spot in the lineup. That seems like a significant upgrade in table-setters and defense. It's an exciting season for Reds fans, as we are not only in the hunt but we have reinforcements on the horizon. It would be tough to have a time share with Gomes and Balentien, as each hits from the right side. Not to mention, I just don't think Balentien is in the organization's plan. I'd still love to see what Dorn could do, but I don't think it happens, especially with the team in the playoff hunt. You mention a few interesting shortstops, but as you point out none of them would make it through waivers. First, on Maicer, I know he's a popular guy in some circles, but I just don't buy him as a regular, every day shortstop. He's already 29 and has a career slash line of .274/.339/.390/.729 and packs a questionable glove at shortstop. To top it off, he's a favorite of Mike Scioscia, so the cost would be prohibitive. Second, the Rays are going to have to make a decision between Brignac and Bartlett, unless they shift one of the two to second base. I wouldn't mind either of the two, but it's difficult to line-up with the Rays on a trade, as they simply have so much talent. Interesting to see you mention Kelly Johnson, as he has long been a favorite of mine. I love his plate approach and his swing mechanics. I mentioned on the message board side that he would make an intriguing option for us between left, 3rd, and 2nd. He would have given us a tablesetting, lefthanded bat and a bit more depth. I'm not a fan of Alberto Callaspo, who seems to pack an iron glove regardless of the position. And, I'm also not a fan of Stephen Drew. I just don't like the Drews for how they handle their contract negotiations. To me, it seems like they value money more than the game. I don't mind players going after the money, as the players are the ones who generate the revenue, but it just seems like there is a proper path for doing so and the Drews never take it. Not to mention, his value always seems to rise about his production due to name recognition. As for Janish, I still think he was a better option than O-Cab, but I guess we'll get a glimpse of it one way or the other until O-Cab gets back. Thanks for the comment. I'll touch on Lowrie in the next comment. As for Jed Lowrie, I'm just a big fan and have been since his collegiate days. He went to Stanford and was just a pure hitter for the Cardinal. Some questioned if his swing would translate to the professional ranks, but he quickly proved that it would. Additionally, he played 2b at Stanford and played it well, but the BoSox wanted to see if he could handle shortstop and he was up to the challenge. At one point, the BoSox were planning to roll out a middle infield of Jed Lowrie at short and Dustin Pedroia at second. Unfortunately for Lowrie, his career has gone off the rails due to a lingering wrist injury and a bout of mono. Regardless, I have always really liked his tools, skills, and baseball IQ. I just think he's a baseball player to the core. He's also a bit of a rarity, as he's an up the middle player with plus on-base skills. And, I think he's got the goods to hold down the shortstop position. In his roughly 550 innings at shortstop at the MLB level, Lowrie is a +7 (+8 in 2008, -1 in 2009, and 0 in 2010) in the plus/minus system, has a .992 fielding percentage, and a UZR/150 of 23.5. It's a small sample size, to be sure, but before the health problems the scouts were stating that he was a legitimate option at shortstop. Personally, I'm a believer. From where I sit, Lowrie could be a switch hitter with an impact bat and at least league average defense at a premier defensive position. He could be a ~.280 hitter with a ~.370 OBP and 15-18 homer power. Add in league average defense and I really think you've got something special. So far in 2010, he's hitting .310/.412/.448 for the Sox. Rumor had it the BoSox offered Lowrie to the Rocks for Chris Iannetta. If I was the GM of the Reds, I would have traded for Iannetta (something along the lines of Juan Francisco and Matt Maloney or Sam LeCure) and then flipped Iannetta to the Sox for Lowrie. From where I sit, Lowrie would be a great fit at the shortstop position and in the #2 spot in the lineup for the next 5+ years. Hmm, the way you describe him sounds like a switch hitting Ryan Theriot, not bad IMO one could do a lot worse. On Maicer Izturis I think his glove work at SS is sometimes spotty because he hasn't been allowed to play there much. He's had to back up 1st OCab and now Aybar there, I think with that comes some rust when he does get to play. As far as his bat goes I get that but at worst he'd be a nice platoon mate with a guy like Janish as he is a much more productive hitter from the left side. What I like about him is he is actually quite similar to Janish offensively in his on base & contact ability and both are decent situational hitters. Neither offer a whole lot of pop but Izturis has more speed and gives us a LH bat with some versatility in case BP or Rolen need a day off. All that and the fact that he really shouldn't cost us too much even though it might be more than one should expect to pay for a platoon/backup IF type. Just because LAA gets great perceived value doesn't mean A: it is great value or B: isn't ultimately worth it if Izturis does what is expected of him. For example I know alot of fans would hate it if we dealt Juan Francisco for him (though not sure LAA would) but I could care less as I'm convinced that his odds of ever coming close to his potential is practically nil. Personally I don't care who they get but they need a top of the lineup bat with good OBP% & contact skills and preferably someone who doesn't hurt us on the defensive side of the ball. Speed and pop optional but they'd sure be nice. Personally, I don't believe a Ryan Theriot comparison does justice to Jed Lowrie. So far in 2010, Lowrie is hitting .308/.429/.538/.967 in 63 plate appearances. In those 63 PAs, he is seeing a robust 4.29 pitches and has hit 2 homeruns, which is already 1 more than Theriot has hit in 479 Plate Appearances in 2010. Theriot has just 15 homeruns in his entire career of 2587 plate appearances. Obviously, a small sample size, but an encouraging one nonetheless. As for Izturis, I wouldn't mind him, but I just think the price outweighs the benefit. The Halos wouldn't want Francisco, because he is the antithesis of everything for which they stand. On Francisco, I'm not concerned about him reaching his potential, rather I just don't think his potential is all that high. He's an offense first type player with a flawed offensive game. Do you ever read this gobbledy-gook that you write, before pressing the send button? Obviously not, or we wouldn't have to endure the same trite sayings like "Having said that", over & over, ad naseum! Not exactly insightful stuff, either. Don't quit your day job, as a future in sports analogy is probably not in your future. Always nice to hear from a fan, epecially when they bring such constructive criticism. Interestingly enough, I didn't use "Having said that" even once in the post, so maybe you should read it before you respond. Additionally, I'd love some feedback on what I need to work on in order to have a future in "sports analogy." Or, maybe you should just search the web for a blog/site that you actually enjoy. That's one of the great things about the internet, there's something out there for everyone.